Throughout the past almost 400 years of maritime history, Newport has maintained its access to the harbor for industry, visitors and residents alike. The city offers a multitude of marina and dockage facilities, as well as moorings and designated areas to drop anchor in the harbor while you're here. Launch services are available from anywhere in the harbor to bring you and your guests to town. Newport's marina dockage range from small private docks dotted throughout the city to large marinas. Newport even has a shipyard and refit facility on the north side of the Goat Island Causeway. This shipyard features complete megayacht refit facilities, equipped with Marine Travelifts to haul massive boats out of the water for work. It includes a restaurant, store and many on-site contractors to perform specialty work on yachts. If you venture a little further up the bay a few miles, Portsmouth has similar capabilities but lacks any true access to downtown Newport except by vehicle. What made Newport RI a famous seaport in the 17th and 18th centuries is still what provides the perfect location for pleasure yachts and sailboats to set anchor or dock in the area- a deep water protected harbor. Newport's harbor is completely protected from the open ocean yet is just a mile or so from the opening to the Atlantic. Even large megayachts will find everything they need to dock directly at many of Newport's wharves with excellent water depths, avoiding the need to moor in the harbor and transport passengers by dinghy or other small craft. Newport's dockage space and mooring field get filled very quickly during the summer months, and it is suggested that during the peak months of June, July and August that you make a dockage reservation in advance with one of the local marinas. If you only plan on being in town for a night, transient dockage may be easier to obtain on a last-minute notice. Regardless of what kind of boat you own, Newport's many dockage options and marinas can provide the perfect home for you while you're visiting Newport. Southern end of the harbor. Contact harbormaster at Channel 16 VHF for directions. (401)848-6492. 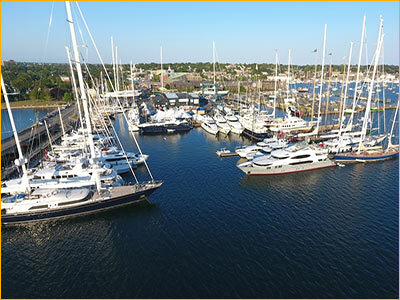 One of the most popular and recommended shipyards in the U.S., Newport Shipyard is a full-service marina and shipyard with over 3,500 linear feet of dock space that can accommodate yachts up to 300+ feet. Its amenities include a dockside café, ship store, fitness center, courtesy vehicles and crew housing. 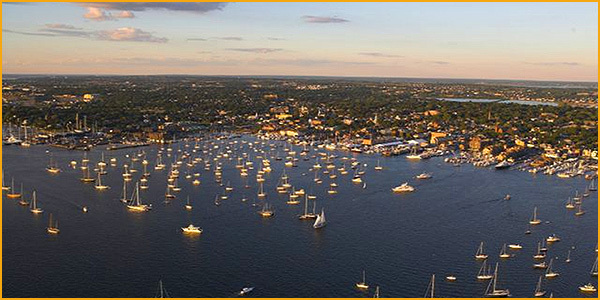 With its friendly staff, welcoming atmosphere and event planning capabilities, Newport Shipyard also is host to many prestigious yachting events, including the Newport Charter Yacht Show, Candy Store Cup and J Class World Championship. 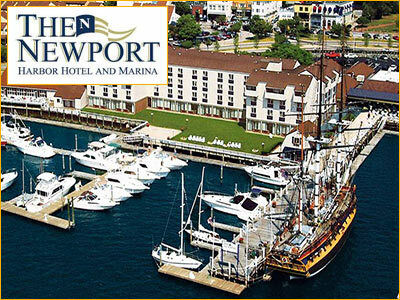 The Newport - Harbor Hotel and Marina offers 60 slips for transient dockage. 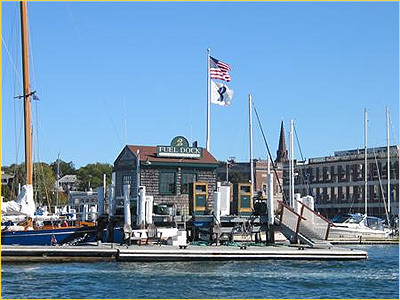 Located directly behind the hotel, the marina offers convenient access to everything in Newport. Whether you are in the for the day or staying at the hotel for a week and arriving by boat, guests of the marina enjoy all the benefits of hotel guests, including indoor heated pool, saunas, showers, changing rooms and complete concierge services.